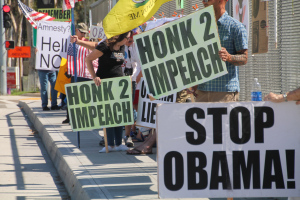 Impeach Obama Protest Planned for UC Irvine Graduation | Stop Obama Now!! Impeach Obama Overpass Protest in San Diego, Ca A protest is being planned for Obama’s impeachment, conviction, removal and punishment at the intersection in front of the Angel stadium in Anaheim by a coalition of Tea Party and other patriot groups. Hundreds of protesters are expected to participate. News of the protest is being spread via various blogs and FaceBook pages. See the link below for the most current details of the protest. President Barack Obama has accepted UC Irvine’s invitation to speak at its class of 2014 commencement ceremony June 14 at Angel Stadium of Anaheim, the White House has confirmed. We will have extra signs, if you need one. Also, bring US and Gadsden flags. Obama hates both of these banners. A rather large crowd of protesters is expected for this event.